I have to sign a ton of non-disclosure forms so I can’t say more, but I am super excited. I hardly watch TV, but when I do, I will get obsessed over a singular awesome/trashy reality TV show. In this moment in time, it is NBC’s The Voice. Let’s overlook the fact we hear these 1,248,124 times per show. Instead, let’s talk about the subject of this blog — aka. me — and why I’m obsessed with The Voice. In my perfect world, which the world of The Voice attempts to create: (a) looks don’t matter; (b) everyone has an equal chance to fulfill their dreams; (c) artists who work hard for art are rewarded, and (d) accomplished artists do not jealously catfight each other, but are willing to help others. I know, I know… it’s just a hope. There is no equal-opportunity world on TV. Like anything on mainstream TV, The Voice is ageist in premise. Plenty of sexist remarks are thrown around. The conventionally cute and perky — albeit pitchy and off-key — singers make it through. And sometimes, these cute-and-pitchy singers even win The Voice, causing me a severe (but temporary) lapse in my love of the show. 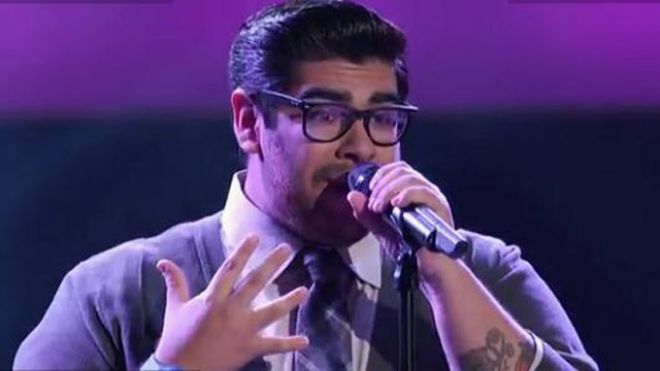 To illustrate: Here is my favorite contestant of all time from The Voice: Daniel Rosa. Daniel Rosa is the first reason I decided I loved The Voice. He was not the most polished singer the show has ever seen. It doesn’t matter. He is a role model for failure and success. How many ways do I admire Daniel Rosa (or, what little I know of him)? Let me count the ways. Enter: Daniel Rosa’s Admirable Moments. Aka: Lessons O’ Daniel Rosa. Example 1: First, Rosa auditioned in Season 2, and was rejected. He could have flipped out. Or blamed everyone else for his failure, talking about how “they don’t recognize real talent” (helloooo, everyone ever kicked off American Idol). Lesson learned: Accept your critiques. Recognize you can improve. Example 2: Then, Rosa came back to audition in Season 3, and was selected by Coaches Cee-Lo and Blake for their teams. Lesson learned: Work hard to follow the advice you receive. Try again. Example 3: On the day of his blind audition acceptance in Season 3, Rosa was overwhelmed by the coaches’ recognition of him. In front of America, he sat at the edge of the stage and wiped tears from his eyes before he was able to speak again. Instead, he talked about how inspired he was and how much confidence he’d gained from his experience. Lesson learned: Every setback is an opportunity to learn and grow. Rosa appeared now two seasons ago, and I keep watching and looking for new contestants who can show me, again, what it means to approach life with a great attitude. Also, while I won’t be able to talk about the trip I’m gonna make to L.A…….. I have to say I am VERY EXCITED. I was never a 12 year old fangirl of a Justin-Bieber-like celebrity, but this performance will be the closest I’ve gotten. I mean…. it’s gonna be the performance of my lifetime! Everything in my life will have led up to this moment.